The Slave Wrecks Project – St. Croix invites the public to join it from 5:30-6:30 p.m., Thursday, July 12, at the University of the Virgin Islands Great Hall when members of the project will present the current status and results of their multiple research efforts across St. Croix. Enter through doors opposite the main entrance. Reserved parking spaces will be found at the east end of the lot. 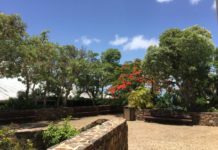 Meredith Hardy, Ph.D. (National Park Service) will present summaries of findings and results from three years of survey and community archeology at Christiansted National Historic Site (CHRI) and Buck Island Reef National Monument. Justin Dunnavant, Ph.D.; Alicia Odewale, Ph.D.; Ayana Flewellen, Ph.D.; and William White, Ph.D., will discuss the research and community archeology they have done at Estate Little Princess. They will present the results of their 2016 field investigations, which provided training and hands-on archeological experience for 12 students from the Boys & Girls Club. They will also share plans for this year’s fieldwork. Slave Wrecks Project Summary Since 2010, the Slave Wrecks Project has fostered public and scholarly understanding of the role of the African slave trade in shaping global history by using maritime archeology as the vehicle for examining enslavement and its far-reaching global impacts. The archeological investigation of slave ship wrecks and related terrestrial sites — such as markets in which the enslaved were sold, maroon sites and encampments, and free black communities — promises to provide a new perspective to bear on the understanding of the Trans-Atlantic and Indian Ocean trading in enslaved people and on the central role that this process played in constituting the modern world. Archeologists from the NPS’s Submerged Resources Center (SRC) and the Southeast Archeological Center (SEAC), in collaboration with the Smithsonian Institution’s National Museum of African American History and Culture (NMAAHC), George Washington University and the Society of Black Archaeologists, are locating and documenting archeological sites, both above and underwater, associated with the historic trade of enslaved Africans. Previous articleHigh Surf Advisory in Effect as Beryl’s Remnant Passes V.I.